What Order Should I Pack My Office In? One of the difficulties of packing an office, whether it is your home workstation or an entire business, is that you likely need to keep working throughout at least some portion of the process. Try these tips from Big Foot Moving & Storage, Inc. for packing your office while maintaining productivity. Decorative items such as paintings, posters, or small statues may be taken down and packed first. While these items make the office a pleasant place to work, they play no role in actual functionality. In most modern offices, the contents of the filing cabinets exist primarily for record keeping, as opposed to day-to-day productivity. Gather filing boxes and transfer the contents of the cabinets to these boxes. Make sure to clearly label what cabinets the files have come from and what files are inside the box to make the unpacking process easier. Books fall into a similar category as files. While they may sometimes be used for reference, your office likely doesn’t turn to them every day. Pack books early into small boxes to keep the weight limited. Bookshelves can be taken apart and packed at the same time as books. Your desk and chair will likely be some of the last things to get packed, but the contents of your desk can largely be stored away in the middle of the packing process. Leave yourself with just the essentials – a few pens, a stapler, and a notepad – and pack or donate the rest. Most of your work is likely done on a computer anyway. Other than your desk and chair, your computer, the office printer, and your phone are likely to be the last things you pack up before a move. The first thing to do before packing up your computer is to back up all data. After that, technology should be carefully packed, ideally in its original boxes with appropriate padding and protection. Finally, your desk and chair should be packed. Be careful of desk components such as a glass top layer that may need extra protection during the packing process. Responsible movers like the professionals at Big Foot Moving & Storage, Inc. will use furniture pads to cushion desk pieces during the move to prevent damage. It has been said that moving a household is one of life’s most stressful events. Moving an office can be even more complicated. It requires a seamless transition so that the success of your business isn’t disrupted. Big Foot Moving & Storage, Inc. appreciates the magnitude and uniqueness of this type of relocation. There’s a lot to do for an office move; the earlier you start planning, the greater the chance you have of achieving the smooth move your company expects. We compiled a short list of preliminary tasks to assist you. A more detailed checklist is also available on our website. Form a relocation team of employees. A project leader should be identified to spearhead the move. The project leader may distribute tasks so there is a point person(s) for each area of the move such as technology, vendors, employee communication, etc. Schedule regular meetings with this team of liaisons to review project status. Create a budget. Define a budget in advance and have funds available for unexpected costs that may arise. In addition to standard expenses such as labor, will you need to purchase any special permits or documentation? Identify a schedule. Start reviewing your options 9+ months prior to your lease expiration. If you are renting company space, will your move date coincide with the lease end date? If you wish to leave the space earlier, discuss your options with the landlord. Consider a buffer for packing and moving office furniture and equipment so as not to extend the lease. The most popular time to move is in the summer, which also makes it the most expensive. Additionally, although it may be necessary to move after normal business hours or over a weekend, this may incur extra fees. Consider current processes and deadlines. How will you align these processes during the relocation? For example, how will you arrange deliveries? How will active projects be handled? In an effort to avoid any delays because documentation and/or equipment is inaccessible during the move, plan a short break period and communicate this to all staff and clients. Hire a professional moving company. Working with the right office moving professionals is an important must-do for any company thinking of office relocation. A professional moving company will guide you through the process, save you money in the long run, and ensure you don’t make any critical mistakes during your move. Obtain several estimates to evaluate cost and action plan. Check the movers’ licensing, reputation, working history, and read reviews. Personal recommendations are the best means of finding the right moving company. Some of the most trusted feedback can be obtained from the property manager or real estate agent that may be assisting your business relocation. Big Foot Moving & Storage, Inc. offers top-quality office relocation services to our clients in the Boston area and beyond. 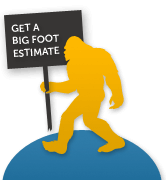 Big Foot Moving & Storage offers the commitment and expertise to complete any size office move smoothly. If you’re feeling overwhelmed with planning your company’s relocation, give us a call at 781-488-3090 to get a free business moving quote.